The glass, steel and aluminum frame sprouting from a two-storey brick warehouse near Montreal’s Marche Central attracts little attention from the street. 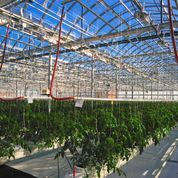 Inside the world’s first commercial rooftop greenhouse, more than 20 plant varieties thrive in different climate zones, from boston lettuce and heirloom tomatoes to strawberries, bok choy, eggplant, swiss chard and purple basil. The fresh produce feeds the 1,000 families and restaurants who’ve signed up for Lufa Farms’ Community-Sponsored Agriculture box, distributed weekly to 30 drop-off points within three miles of the farm. “Going direct to the consumer means you can’t just be a tomato farmer,” said president and founder Mohamed Hage. Hage and three partners spent four years working with plant scientists, architects and engineers to design the $2 million greenhouse and six months erecting the 31,000-square-foot structure, which opened in March 2011. Fruits and vegetables from local organic farms supplement Lufa’s greenhouse vegetables in its CSA boxes. 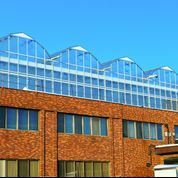 Building a greenhouse on an urban rooftop has several advantages, Hage said. The downtown core can be 10 degrees warmer than outlying areas; cities produce more carbon dioxide, which plants love; and the roof provides “free” heat lost from the offices and warehouse space below. This helps push the coldest night-time temperature in the greenhouse to just before dawn. “Even when it’s minus-30 outside, as long as it’s sunny we can use the heat from the sun thanks to the buffering effect from our building,” he said. Energy curtains cover the glass at night to trap the heat, and high-efficiency natural gas boilers and a hot water system add heat when needed. Lufa also collects rainwater from its roof and recirculates the nutrient-rich water that sustains its plants. Hage and his partners are now seeking owners of greenhouse-friendly rooftops on new and existing buildings in Toronto, Boston and New York City. They expect to start building urban greenhouses on at least two sites in 2013. “We’ve had quite a bit of interest from several U.S. cities,” Hage said. wow that is a cool concept .In Calgary the growing season is so short (sometimes June to Aug some years) A roof top greenhouse would extend the growing season greatly! Very interesting…I�ve passed it onto George. I just finished my last blood orange today and I need more!! What little store in your neighbourhood sells them. And those other little one’s, were so delicious!